While everyone knows Highgate Cemetery is full of interesting and noteworthy monuments, I didn’t stumble across this one until 2009. It’s genuinely a surprise when you stumble upon it – you rarely see the word ‘dead’ celebrated in a graveyard, let alone spelled out in huge laser-cut letters on a six-foot slab of granite. The painter and print-maker Patrick Caulfield (1936-2005) was a contemporary of David Hockney. Regarded as part of the Pop Art movement. and a Turner Prize nominee in 1987, Caulfield designed the memorial which now sits on his grave. 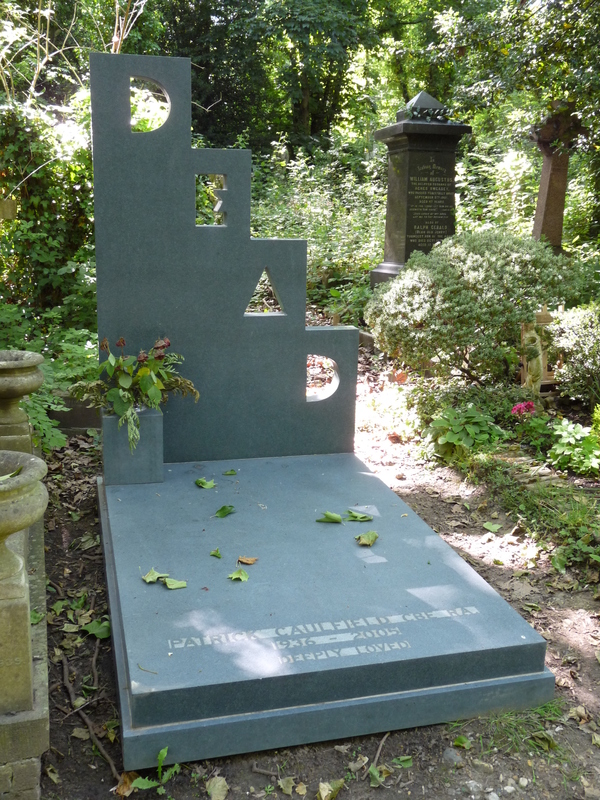 There’s lots of Caulfield’s work available to see online, but if you fancy seeing the grave, it’s in the east side of Highgate Cemetery – down the central road, and almost to the railings at the very end.